Busy time at work has meant that I haven't really kept up with the menswear shows from January or the most recent spring couture shows. However, when you're a Friday night homebody like I sometimes am after a long week, some hours open up. I had a chance to get lost in style.com's Paris coverage, and as I expected, I was most enchanted by Elie Saab's collection of gowns and intricately-beaded dresses. The style.com critic was right draw similarities from Tom Ford's Oscar gown for Gwyneth and Valentino's previous collections as well, you can see them in a few looks. My favorite looks (not surprisingly) featured a demure crew neck and t-shirt sleeve. I absolutely love the contrast of a "casual"shape with an elegant spin, like a ball skirt and glittering beading. Oh, and pockets? Fogheddaboutit - I'm sold. Great photos!!!!! I totally agree, crew necks are one of my favorite necklines, theres so many ways to have fun with it! These looks are all so beautiful! 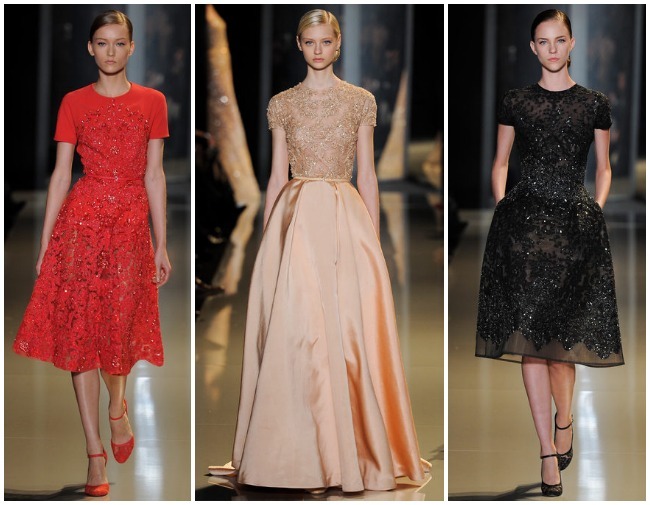 Elie Saab is always one of my favorite shows, come Paris couture week! Elie Saab's collection is remarkable. I'm loving it. Stop by whenever you like, it makes me happy!! Sooo beautiful. Elie Saab always blows me away. these are the most beautiful looks! It's so interesting to me how fashion comes full circle. These dresses have such a feminine vintage feel.